When friends ask me why I haven’t upgraded to digital high-definition from my 20-year-old CRT television set, I put a movie like this into the dvd player as explanation. It looks bad enough on my old workhorse, I can’t even imagine how bad it would look on HD. And really, I don’t want to ever stop watching movies like this, no matter how abysmal the video and audio might be. It is a riotously colorful Arabian Nights vehicle for tall, handsome Ajit in a last gasp as hero, replete with the loony touches and sumptuous sets and costumes for which director Mohammed Hussain is beloved (at least by me). 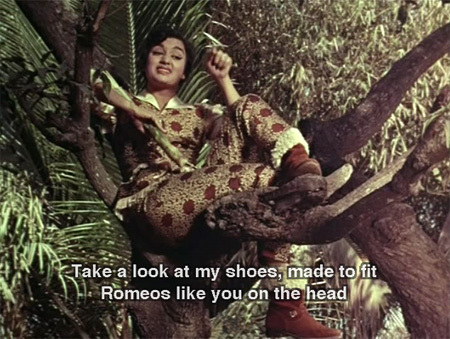 Usha Khanna’s music is plentiful and fortunately pleasant (sometimes very much so), and Sayeeda makes a lovely heroine. The lack of subtitles, choppy editing, and poor made-from-vhs-tape quality cannot diminish my pleasure in it; I am even thrilled by the (some would say poorly) hand-drawn title credits. I love it when a film exceeds my expectations, not that I really had any for this one. But from the very first scene I was involved in the characters and engrossed in the story. Yes, there is a lot of self-sacrifice—but it’s mostly done by the hero, not the heroine, and it actually benefits people! And it had a message which might have made people think about social norms in a new light! I am totally on board with that. I also liked the Rajendra Kumar-Meena Kumari pairing, one I haven’t seen before. Plus there’s the criminally underrated Minoo Mumtaz and a bevy of absolutely lovely songs by Ravi, including two of the best children’s songs ever, and a cat birthday song (how could that possibly be bad?). It reminded me a bit of the later Dil Apna Aur Preet Parai, a film I also somewhat unexpectedly liked. In the wake of my post espousing the awesomeness that is Asha P, several people recommended that I watch this. 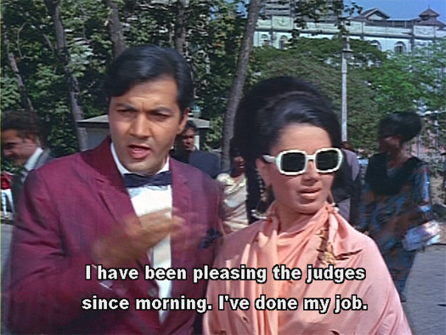 And indeed, I’m glad they did: Asha is at her feisty, gun-totin’ best. And the songs—my God, the songs! They are made of beautiful, all of them, and the film is worth watching just for them alone. 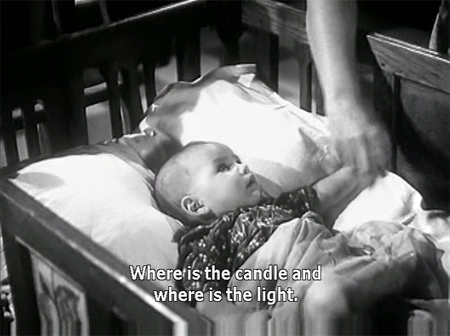 My quibble with the movie is that things slow to a crawl in the middle as the combative courtship between Asha and Joy Mukherjee drags on—and it turns them into cruel and thoughtless people, too. The last half hour picks up again, luckily, but the middle hour or so really could have used some editing (and an animal activist or two). The Comic Side Plot is also far too intrusive: Mehmood again, given lots of screen time to compensate for his hefty compensation, I guess. A little of him goes a long way (and a lot of him can bring the main plot to a halt) especially when it’s the same exact CSP every time. 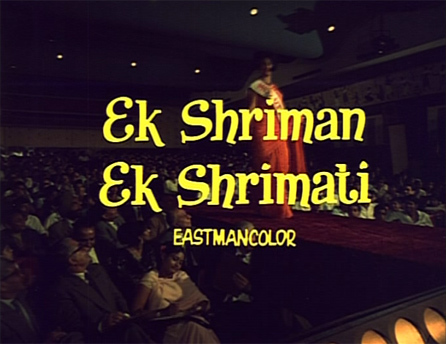 This is one of the most romantic films I’ve ever seen, with absolutely sublime music by Naushad. It’s a Muslim social drama set in Lucknow, with all the attendant grace and beauty you would expect. Elaborate sets and costumes are de rigueur! Love blooms for Sadhana and Rajendra Kumar, and there is also a lovely romance between the so handsome Ashok Kumar and pretty Nimmi. Obstacles and misunderstandings abound, seasoned with (mostly) funny-man Johnny Walker’s antics, and made compelling by the people and relationships you can’t help but root for—this is my favorite kind of movie. Even the fairly poor condition of the color print only adds to the old-fashioned and elegant ambiance of it all. This one is a little late for Bhappi Sonie Month, but better late than never is my middle name. It’s a very silly film, which is then cobbled together with a very melodramatic film, giving us total paisa vasool. If it lacks a certain continuity and flow, and there are gaping plot holes, who cares? Not me! Can anyone tell me who this lovely lady is? She was “Maa” in films from the 1950s into the 1980s. v9y knew the answer: it is Mumtaz Begum (or Begam). If I had an Indian mother I might want it to be her!